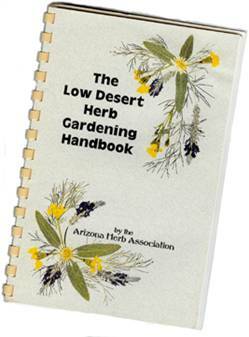 40 pages of information about planting, growing and harvesting herbs in desert climates. Month-by-month, easy-to-follow guidelines on watering, propagating, transplanting, and pruning. Written, designed and edited by longtime AHA member Anne Fischer, with assistance from AHA past President Mike Hills. A must-have for every desert herb gardener! Also available by mail order. Please mail your check (made out to “AHA”) for $12 (AHA Member price, $10 + $2 S&H) to (Include your current mailing address with your check, please! ): Arizona Herb Association, P.O. Box 63101, Phoenix, AZ 85082-3101. 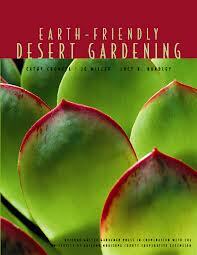 This book covers all the basics for desert gardeners. 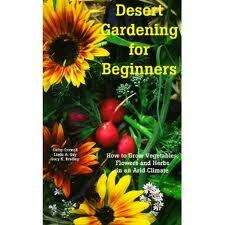 Chapters include desert soil characteristics, soil preparation, removing Bermuda grass, garden design and location, making compost, cultivation techniques, effective watering, managing insects, diagnosing problems, as well as specific tips for vegetables, flowers and herbs. Also includes are three planting calendars that provide the best months to sow hundreds of vegetables, flowers and herbs for maximum success. Published by the Master Gardener Press. Successful landscaping in the Southwest requires a different set of techniques than used by gardeners in most of the Country. 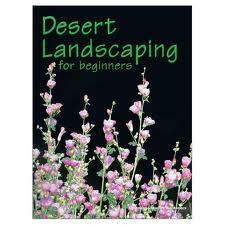 Desert Landscaping for Beginners contains the latest research-based information from the University of Arizona, written in user-friendly language. Each chapter was written by a local expert with years of experience in that subject. Published by the Master Gardener Press. Regardless of your gardening experience, you can easily save money on utility bills, conserve water, reduce yard waste sent to landfills, and create a low-maintenance landscape that is in balance with its natural surroundings. Published by the Master Gardener Press.